Isolates should be pure and phenotypically identified as S. aureus prior to testing. Control strains of MRSA (ATCC 33591), MSSA (ATCC 25923), and mecA-negative Staphylococcus epidermidis (ATCC 14990), in addition to a no-template (water) control, should be included with each run. Prepare a 1.0 McFarland standard suspension of the organism in 0.85% NaCl. 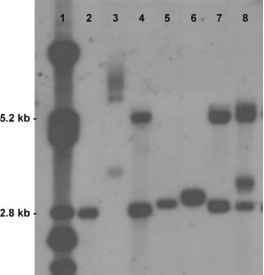 Extract DNA using either commercial nucleic acid extraction kits or Chelex-100 resin. For the latter, Chelex-100 is added to 800 pL of bacterial suspension to a 1.5-mL final volume, followed by vortexing, heating to 80°C for 10 min, and centrifugation for 15 min at 16,000 xg, resulting in a supernatant containing template DNA. Preferred specimens include nasal swabs or blood from positive blood cultures. For the latter, a single morphotype of gram-positive cocci in clusters resembling staphylo-cocci should be confirmed prior to testing. Obtain a 0.5-mL aliquot of blood and centrifuge for 2 min at 900 xg to remove particulate matter (e.g., charcoal). Resuspend the pellet in 0.85% NaCl and repeat centrifugation. Perform another centrifugation step at 12,000 xg for 15 min to pellet down the bacteria. Resuspend the pellet in 0.85% NaCl to make a 1.0 McFarland standard suspension, then follow the subsequent directions for template extraction as outlined in ''Laboratory Cultures'' above. For nasal swabs, the use of commercial DNA extraction kits is recommended. Control strains should be included as for laboratory cultures.